BS 65000 identifies organizational resilience as a dynamic concept that details the integration and co-ordination of various processes and resources that are often already in place such as those that form part of the Risk, Business Continuity and Crisis management activities. Through the standard overall performance improvement can be gained by taking care to understand processes and activities in greater depth and with a particular emphasis on the relationships they have to other activities, resources and stakeholders. This will sound familiar to many Business Continuity professionals, but an essential difference is the strategic perspective along with breadth and depth required. These combine to help build recognition of the key activities of the organisation and helps embed of more strategic set of corporate values that can help guide and prioritise other related activities. Key to the standard is cutting through silos, structures and hierarchies with the aim of protecting and enhancing value chains. While BS 65000 will certainly offer insight into how sudden disruptive events can be better managed, it also identifies the importance of how the organization will need to manage the disruptive change, both internally and externally, created by changing markets and other business influences. The approach taken in the development of BS 65000 has been to produce guidance that helps integrate the skills, knowledge and capabilities across existing professional disciplines and use these to more closely align onto the both strategic and operational goals more coherently. A core theme found throughout BS 65000 is the importance of information and communication and the standard places a heavy emphasis on creating systems and processes that help facilitate good decision making across the business. Companies that have shown they have higher levels of resilience have a number of characteristics that really do make a long term difference to their performance. One of the most important is the ability to proactively ‘learn and adapt’. Consequently, a high profile is given to the value of how lessons can be learned and then embedded into business practices more widely. Overall, the Standard offers organizations a structure that helps align processes throughout all its operations and with a strategic focus that will help the engagement with top management. You can request the slides from the launch by clicking the link to the right. 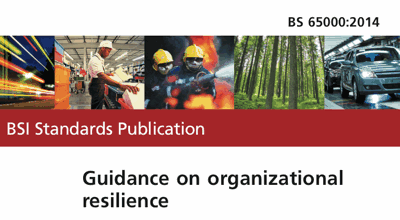 If you would like to know about the Organizational Resilience standard please contact us directly at info@continuityforum.org. You can read more here and here. The Continuity Forum provides briefings on on how planning for organizational resilience can help your organistion. To arrange yours please contact us HERE!